Celebrating the limited-time release of three new sandwiches featuring King’s Hawaiian buns, Arby’s is offering 10 fans a one-of-a-kind Hawaiian vacation for the cost of one sandwich, just $6. The entire trip will be a one-day adventure that includes a first-class flight to Hawaii, eating the new King’s Hawaiian Smokehouse Brisket, the King’s Hawaiian Sweet & Spicy Luau Chicken and the Big Kahuna on the beach in tropical paradise and a return flight home with no overnight stay and no additional stops. 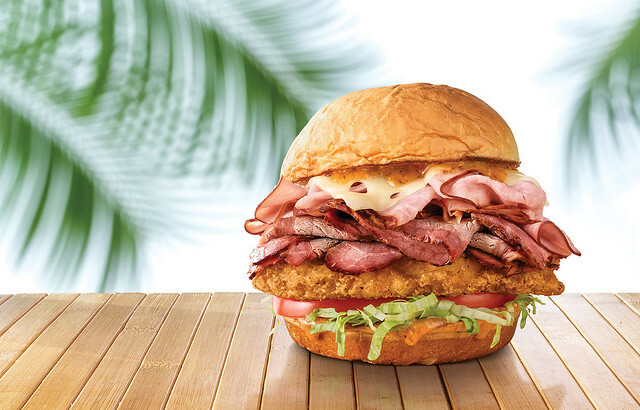 Five exclusive spots will be available for purchase on Friday, April 12, at Arbys.com/aloha. “We have some of the most passionate fans in the world, and I can’t imagine a bringing a new sandwich to our menus without inviting them to join the celebration. The King’s Hawaiian Smokehouse Brisket includes sliced, 13-hour smoked beef brisket, with melted smoked Gouda cheese, crispy onions, smoky BBQ sauce and mayonnaise on a toasted King’s Hawaiian bun. The King’s Hawaiian Sweet & Spicy Luau Chicken includes a crispy chicken filet with sliced pit smoked ham, melted Swiss cheese, lettuce, tomato and a sweet & spicy pineapple habanero sauce on a toasted King’s Hawaiian bun. The Big Kahuna piles a crispy chicken filet, sliced beef brisket and pit smoked ham, which is topped with melted Swiss cheese, lettuce, tomato and sweet & spicy pineapple habanero sauce on a King’s Hawaiian bun.